A European space plane project will take to the skies a few months from now for a crucial test. Europe’s biggest aerospace manufacturer, Airbus Group, plans to drop its scale-model prototype prototype Spaceplane from an altitude of 10,000 feet (3,048 meters) over Singapore in May. If that trial goes well, another unpowered drop test — this time from 100,000 feet (30,480 m) — should follow next year, officials said. You can see concept photos of the European space plane here. The space jet would then coast to above 62 miles (100 kilometers), the generally accepted boundary between air and space. The vehicle would use cold gas reaction control system jets to orient itself for atmospheric re-entry. The company stated in 2007 that the project would cost 1 billion euros ($1.37 billion at current exchange rates), and that it was seeking private investors. At the time, seat prices were expected to be at least $200,000, but EADS had no intention of being an operator. Rather, it would sell the spacecraft to tourism companies. After years of saying nothing about the project, Airbus has revealed that this May a helicopter will hoist the scale model — which at 15 feet (4.6 m) long is one-quarter the size of the actual Spaceplane) — to about 10,000 feet, at which point it will be dropped. The vehicle will be remotely controlled for a sea landing east of Singapore in the South China Sea. Christophe Chavagnac, Spaceplane programs manager and chief engineer at Airbus’ Defence and Space division, spoke exclusively to Space.com about the project. "This first one [test], it will be remotely controlled from the ground," he said. "What we are looking for is to validate the Spaceplane itself, and the Spaceplane itself is in a gliding mode." The flight profile revealed in 2007 described the vehicle reaching its 62-mile apogee, re-entering Earth's atmosphere and then gliding to a point where it could restart its two turbofan engines and make a powered return to its takeoff runway. Spaceplane’s design has two turbofan engines, located on either side of the rear of the fuselage, like a business jet. These engines power the first part of its ascent before the vehicle's rocket motor is ignited. This is unchanged from the 2007 design, as is the rocket motor, which is being designed by Airbus Defence and Space and uses a combination of oxygen and methane. 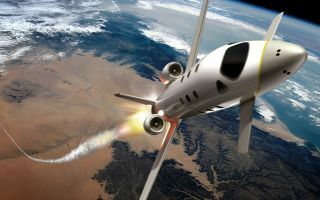 Changes to the suborbital Spaceplane design since 2007 include the removal of its canard, a small winglike structure on its nose, that can aid lift on takeoff and help with in-flight maneuvering. For Spaceplane, the canard was also designed to aid the atmospheric re-entry. The exact re-entry and descent profile of Spaceplane has never been revealed, and Chavagnac declined to give Space.com flight profile details. Spaceplane’s wing has also changed, with a slender design being replaced by a more conventional style. Chavagnac described the new Spaceplane design as looking "heavily" like French business jet manufacturer Dassault’s Falcon 7X. He declined to say how much Airbus had spent on Spaceplane since 2007, but he did say that the May test would cost "some millions of euros." Asked how big the Spaceplane team is, he stated it was "not a couple of people" and "not hundreds of people." He added that the team includes people in Singapore as well as in Europe. In 2012, Airbus signed a contract with Singapore firm Hope Technik, which has assembled the composite-material Spaceplane prototype. The vehicle was displayed at the Singapore Airshow, which took place Feb. 11-16. Hope's engineers are now fitting the avionics and flight control systems to the quarter-scale prototype. The company's contract with Airbus will end with the May test, Chavagnac explained. The same prototype will be used for the 2015 drop test from 100,000 feet, which will use a stratospheric balloon. For this test Chavagnac said, "What we have to find now is a stratospheric balloon and a test range, which is not such an issue." Singapore, an island that is about 25 miles (40 km) long, is 1 mile (1.6 km) from the coast of Malaysia and about 50 miles (80 km) from one of the western islands of the Indonesian archipelago. This means the Spaceplane could fly into foreign airspace if the 100,000-foot drop does not go according to plan. When announced in 2007, Airbus’ business case predicted that five space jets and 20 engines would be built every year, and that each vehicle would operate for 10 years with one flight a week. As well as tourists, Airbus expected to fly scientific and military missions. A seven-year development timetable was expected, which would lead to certification. The European company also expected the operator of its Spaceplane to have won, within five years, 30 percent of the space tourism market that was predicted by the Futron Corporation to be worth hundreds of millions of dollars. In 2007, the company talked about launching the project commercially in 2008 and said it had financiers interested in it, but then the financial crisis occurred. That year, the company publicly stated that work would slow on the Spaceplane. Since then, Airbus has been very quiet about its Spaceplane work, fueling speculation that the project had been dropped. Airbus isn't the only company working on a suborbital space plane. Virgin Galactic and XCOR Aerospace, for example, may be flying their vehicles — known as SpaceShipTwo and Lynx, respectively — commercially within a year or so.